Manfred Broy’s research is in software and systems engineering both in theoretical and practical aspects. This includes system models, specification and refinement of system and software com­ponents, specification techniques, development methods and verification. He is leading a research group working in a number of industrial projects that apply mathematically based techniques to combine practical approaches to software engineering with mathematical rigor. His main topics are requirements engineering, software and system architectures, componentware, software development processes, software evolution, and software quality. In his group the CASE tool AutoFocus was developed. 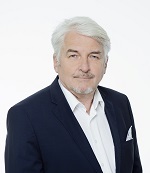 Since January 2016 Professor Broy is founding president of the Bavarian Center for Digitization. There he is working on the topics of digital transformation and digital innovation.